A keloid occurs when too much scar tissue develops around a healing wound. Dermatologists like Dr Glass and plastic surgeons employ different techniques to treat these scars, and two of the most commonly used treatments are steroids and surgery. Some people, particularly those with dark-coloured skin, are more susceptible to keloid scar formation. This is because a person’s genetic makeup can affect the way his or her wounds heal and hence the likelihood of getting keloids. Dermatologists and plastic surgeons, however, can do certain things to minimise the risk of developing a keloid scar. Most doctors who treat keloids use corticosteroid injections the first time. Triamcinalone is most commonly used. The medication is injected directly into the scar tissue, where it is absorbed well. This can make it more effective than topical steroid creams which are put on the surface. Scar removal creams advertised and available from the chemist without a prescription do not usually work on thick scars. The Dermatologist injects the steroid into the fleshiest part of the scar, making sure the medication spreads throughout the area as evenly as possible. 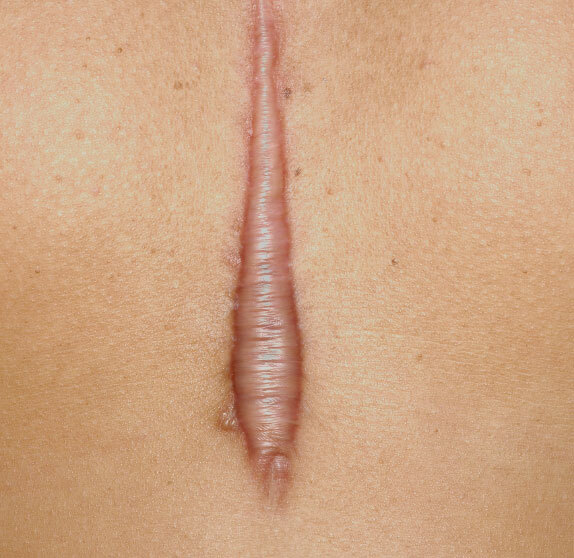 After the initial treatment, the scar’s appearance may improve and flatten. However, the treatment will often have to be repeated a number of times to achieve the maximal result. Corticosteroids target inflammatory agents and minimise scar tissue formation by halting the production of collagen to some extent. It doesn’t really eliminate the scar totally but does soften and flatten it, thus improving its appearance. Changes in skin pigmentation is one of the possible side effects of steroid injections. In addition, tissue atrophy (thinning) may occur. Certain patients may see results after surgery. Surgical revision of keloid scars is considered for a few patients. Patients who seek treatment for a single keloid scar and who has no family history of having this type of scar may be considered a good candidate for the procedure. Moreover, patients with earlobe keloids have good chances of seeing themselves keloid-free after surgery than patients with other types of keloids. There is however the risk of further keloid development post revision surgery. To schedule an appointment with Dr Glass, London keloid scar expert, to discuss treatment options, call us today 020 3282 0011 or email info@danielglass.co.uk.